They are versatile - they are odd - they are challenging to fly. They are my favorite plane - the Lake Amphibian. 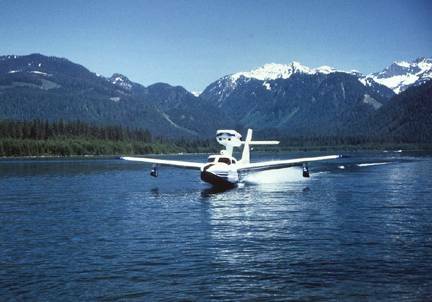 The Lake Amphibian is a seaplane that was invented in the late 1940s by _____ Thurston. 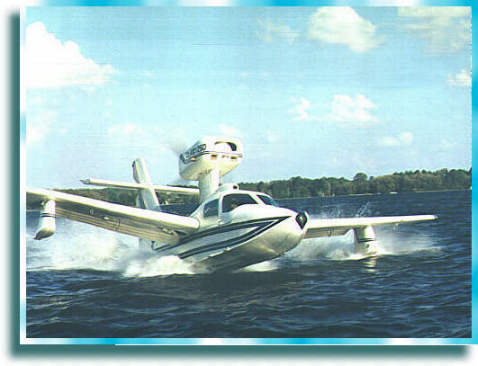 It went through several early versions (C-1 Skimmer, C-2 Skimmer) before debuting in 1958 as the Lake Amphibian. The airplanes have been assembled by hand, one at a time, in a factory in Sanford, Maine since 19__. The LA-4 was replaced by the LA-4-200 in (c.1970?). The LA-4-200 was replaced by the EP in 197_ and EP production ceased with the introduction of the larger LA-250 model in 198_. Regular production of the Renegade model ended in 198_ and since that time, new airplanes are built "to order" when contracted for. Two new LA-270T airplanes were built in 2000, and they sold for approximately $400,000 each. LAFC holds a fly-in conference during the first week in February each year. It starts on Sunday afternoon and ends on Wednesday evening. The fly-in is held in central Florida - it has been held at Winter Haven (GIF), Avon Park (AVO), and River Ranch (2RR). Click here to see a description of my airplane. Is the international owner's club for Lakes of all kinds. LAFC has a web site here. My answers to some common Lake-related questions. There are several shops I am aware of that work on Lakes on a regular basis. It is highly recommended that you take your airplane to one of them. If your shop specializes in Lake aircraft and is not listed here, please email me and I will be glad to add it.